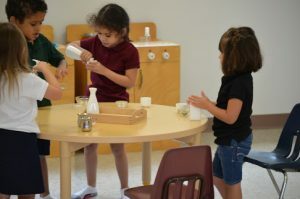 Cypress Junction Montessori is a quality Montessori school located in downtown Winter Haven offering full and half day preschool options. Our three and four-year-old preschool students begin their educational journey in our primary classroom. This mixed aged classroom consists of preschool and kindergarten students. Preschool students start their day in line time with their teachers and fellow classmates. Here they’ll pledge the flag, be introduced to new lessons, sing songs and complete group activities. Line time is followed by a three-hour work cycle where students enjoy a variety of activities, known in the classroom as lessons, that introduce them to the important foundational subject areas listed below. Their day is rounded out with plenty of recess time, snack, lunch, nap time, yoga and group and seasonal activities. CJM accepts Early Learning Coalition’s School Readiness funding. Apply here. We are also proud to offer scholarships through the CJM Early Learning Scholarship Fund. You can apply for the scholarship program here. To begin the enrollment process for either our full day or half day program for three-year-olds and four-year-olds, simply fill out the enrollment application here. The preschool classrooms, curriculum and teachers acting as guides at Cypress Junction Montessori focus on the following areas. Children learn the skills they need to independently care for themselves and their environment in the practical life area. Lessons build coordination, and students learn grace and courtesy. Preschool students are introduced to concepts such as length, width, temperature, mass and color. They learn to order, classify and describe a variety of objects in various clarifications. Preschool mathematics lessons use manipulative materials (objects the kids can hold and work with) to introduce and build an internalized understanding of math foundational concepts including numbers, symbols and sequence. Students develop basic skills in writing and reading through the use of sandpaper letters, alphabet cut-outs, and various presentations allowing children to link sounds and letter symbols effortlessly and to express their thoughts through writing. Cultural activities expose the child to basics in geography, history, and life sciences. Music, art, and movement education are part of the cultural curriculum. Our goal is to provide our preschool students with an early solid foundation and genuine love of learning. Students are prepared for elementary school as we foster a positive attitude toward school, inner security and a sense of order, pride in the physical environment. We observe characteristics such as curiosity, initiative, persistence, self-discipline, responsibility, care, respect and positive decision making in our preschool students. This foundation enables them to acquire more specialized knowledge and skills throughout their school career. Schedule a tour to see our preschool program by giving us a call at 863-259-1490 or emailing us! Fill out an enrollment application: Click here.